As a licensed exterminator, we can take care of a number of pest problems. If you’re looking for a licensed exterminator in the Lakeland, Florida area, you may perform an online search to get a list of options. However, you don’t have to go any further down the list than Florida Bee Removal. We are a licensed exterminator with more than five decades of experience with removing bees, wasps, yellow jackets, and hornets from both commercial and residential properties. Each of our technicians has been properly trained in extermination techniques that eliminate the pests for good, instead of just getting rid of those that you can see. As a licensed exterminator, we can take care of a number of pest problems. One of our areas of expertise is bee control, although we don’t exterminate the bees. Instead, we carefully remove the hive and/or colonies from your property to relocate the bees. Since bees are so vital to our natural ecosystem, we understand the importance of protecting them. However, protecting them doesn’t mean you have to cohabitate with them. Having a beehive on your property can be dangerous, especially if you enjoy spending time outdoors with your loved ones. Even your furry friends can get stung if they poke their nose into the hive or otherwise bother the bees. 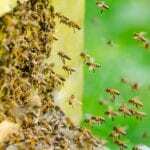 Our goal at Florida Bee Removal is to protect those who occupy your property from the risk of being stung or otherwise injured by some type of stinging insect. For more information about the licensed extermination services we provide, don’t hesitate to give us a call.